The Ras/Raf pathway is a crucial cell signaling pathway utilized by eukaryotic cells for growth and proliferation, and it is highly conserved amongst all eukaryotic organisms. Mutations in this pathway lead to uncontrolled growth and proliferation of cancerous cells, effectively giving them a major advantage over normally functioning cells. Not surprisingly, numerous specific mutations and epigenetic changes to these proto-oncogenes contribute to carcinogenesis in colon, skin, breast, lung, and other cancers. In this review, I explore the role of the Ras/Raf pathway in many different types of cancer. I highlight up and coming gene therapy techniques that allow for targeting of the Ras/Raf pathway. The future is bright as treatment is finally reflecting the fact that cancer is different in everyone, and individualized treatment is realistic and effective. Cancer is one of the most complex and intriguing illnesses studied by the medical and scientific community. It is particularly distinctive due to the fact that development of cancer can be unique in each patient. Factors influencing the advancement of cancer include a seemingly limitless pool of modalities and influential factors constituted by genes and the environment. These factors cannot be considered separate from one another; rather the interactions between a person’s genetic background and environment can combine in a wide variety of ways. The places we live, the air we breathe, the food we consume, the amount of physical activity we subject ourselves to, and many other factors influence our susceptibility for cancer development. Even though many different genetic aspects can influence cancer development, some are utilized more so than others. For example, many different types of cancer will manipulate the Ras/Raf or MAPK pathway for growth advantages partly due to the crosstalk with other fundamental pathways. The Ras/Raf pathway is fundamental to every eukaryotic cell’s ability to grow, proliferate, and even undergo programmed cell death. (1)Yet, this primeval and conserved pathway is still not completely understood; proteins involved in the Ras/Raf pathway are still being discovered, particularly in light of biological cross talk that occurs in this pathway. Cancer is a complex and diverse disease that can affect essentially all types of cells and tissues. Tumorigenesis, though seemingly random, is based on a number of events related to inherent genetic factors as well as environmental factors resulting in genetic or cellular turnover changes. Though the “two-hit mechanism” is a common explanation to tumorigenesis, it may take up to six or seven independent events to induce neoplasia. This explains why many cancers take decades to develop, even if a person has familial or de novo genetic susceptibility to a specific type of cancer when they are born. However, as the dysplastic cells gain access to more advantageous mutations as time goes by, the last few genetic hits can occur more quickly than the primary advantageous mutations. This is due to genetic instability in dysplastic cells, resulting in the probability of development of other mutations (which may not necessarily be beneficial) to increase. One of the most commonly affected genes is the proto-oncogene Ras: upregulation of Ras is so advantageous that approximately 30% of tumors carry a Ras mutation. (4, 5) Ras generally rotates from its active GTP-bound form to its inactive-GDP form. Upregulating Ras by epigenetic events such as hypomethylation, or activating mutations that cause the Ras to be constantly bound to GTP result in upregulation of the remainder of the pathway. (6) This leads to uncontrollable cell proliferation, growth, and transformation due to upregulated transcription factors allowing constant transcription of genes influencing these cellular activities. Activating point mutations of the KRas protein are very common in pancreatic and colon cancers, and also present less frequently in lung and breast cancers. KRas mutations are common in DNA mismatch repair (MMR) proficient cancers; hence why about 35% of colon cancers have a mutation in KRas. Mutations in DNA mismatch repair provide a steady stream of point mutations. This influx of point mutations and high turnover rate of colon epithelial cells, makes the possibility of mutations to Ras much more likely in colon cancers. (2) One study by Rajogopalan et. al found 169 mutations in KRas which included a variety of alterations to codons 12, 13, 59, and 61. (7) Through analysis of a number of different tumors, the authors also found that KRas mutations seem to occur after the initiation phase of tumorigenesis, but before the neoplastic population becomes malignant. According to DeLuca et. al, mutations to HRas are found only in about 1% of breast cancers. Findings by Kompier et. al showed that HRas mutations occurred in 14 of 257 (less than 1%) samples of biopsies of primary tumors from patients with bladder cancer. (10) Though mutations to HRas seem to occur in the minority of bladder and breast cancers, polymorphisms of the HRas proto-oncogene are more relevant to cancer development than mutations occurring to HRas itself. In one GWAS study, rare HRas alleles associated with hormone receptor negative tumors have been connected to more aggressive breast cancer tumors, and more common in African-American females. (9) Garett et. al sampled a wide variety of women of different races and ages to determine a connection between polymorphism of the HRas allele and breast cancer. The study found that African-American women were 3-11 times more likely to develop aggressive breast cancer than the control groups, while women of European descent were only approximately 2 times more likely to develop aggressive breast cancer as compared to the control groups of the study. The same rare HRas polymorphism was found to be connected more frequently with breast cancer in younger women. The breast cancers in this subset of patients was commonly more aggressive than breast cancers sampled from older women. Early onset of breast cancer was linked to estrogen and progesterone receptor negative tumors, which is often linked to a worse prognosis and advanced-stage tumors. These ER and PR negative tumors were often linked with the rare HRas allele. The scientific community has accepted that a cure-all for cancer most likely does not exist. Samples collected from cancer patients exhibit vastly different genetic profiles, and patients themselves have different environmental exposures and socioeconomic backgrounds. Almost every case of cancer is different, though some may have overlapping mutations or epigenetic events. Based on this, researchers have begun to look at individual gene therapies based on the genetic makeup of each patient’s cancer. Small molecule kinase inhibitors targeting upstream and downstream of Ras are showing promising development as well. Specific drugs like imatinib, an inhibitor of BCR-ACL, have the ability to target specific kinase-activating proteins in the pathway like Ras or MEK; by doing so, the proliferation, survival, and growth advantages cancers access, are effectively shut down. (14) MEK inhibitors seem to have a great specificity for their targets, and have a good reputation in safety. Table One has a list of MEK inhibitors and important details regarding each. Sorafenib, Raf kinase and VEGFR inhibitor, had significant activity in renal, colon, pancreatic, lung, and ovarian tumors. (18) 70% of patients with tumors taking Sorafenib, had shrinkage in size or stabilization. (19) However, many times, a kinase in the Ras/Raf pathway often has more than one target, so avoiding one protein isn’t necessarily detrimental. Therefore, small molecules will likely need to be combined with other cancer target therapies or cytotoxic agents. The Ras/Raf pathway is so useful for cancer cells because of its influence on cell survival including regulation of apoptosis, cell cycling, proliferation, growth, cell motility, and angiongenesis. Therapies and cancer drugs which target the Ras/Raf pathway are still largely being developed today. Most successful therapies are still in the early stages of clinical trials. Kinase inhibitors have shown some of the most promising advances with the least major side-effects. 1. Kolch W. Meaningful relationships: the regulation of the Ras/Raf/MEK/ERK pathway by protein interactions. Biochemical Journal. 2000;351(2):289-305. 2. De Luca A, Maiello MR, D'Alessio A, Pergameno M, Normanno N. The RAS/RAF/MEK/ERK and the PI3K/AKT signalling pathways: role in cancer pathogenesis and implications for therapeutic approaches. Expert opinion on therapeutic targets. 2012;16(sup2):S17-S27. 3. Adjei AA. Blocking oncogenic Ras signaling for cancer therapy. Journal of the National Cancer Institute. 2001;93(14):1062-74. 4. Johnson L, Mercer K, Greenbaum D, Bronson RT, Crowley D, Tuveson DA, et al. Somatic activation of the K-ras oncogene causes early onset lung cancer in mice. Nature. 2001;410(6832):1111-6. 5. Khosravi-Far R, Der CJ. The Ras signal transduction pathway. Cancer and Metastasis Reviews. 1994;13(1):67-89. 6. Khosravi-Far R, White MA, Westwick JK, Solski PA, Chrzanowska-Wodnicka M, Van Aelst L, et al. Oncogenic Ras activation of Raf/mitogen-activated protein kinase-independent pathways is sufficient to cause tumorigenic transformation. Molecular and cellular biology. 1996;16(7):3923-33. 7. Rajagopalan H, Bardelli A, Lengauer C, Kinzler KW, Vogelstein B, Velculescu VE. Tumorigenesis: RAF/RAS oncogenes and mismatch-repair status. Nature. 2002;418(6901):934-. 8. Omholt K, Platz A, Kanter L, Ringborg U, Hansson J. NRAS and BRAF mutations arise early during melanoma pathogenesis and are preserved throughout tumor progression. Clinical Cancer Research. 2003;9(17):6483-8. 9. Garrett PA, Hulka BS, Kim YL, Farber RA. 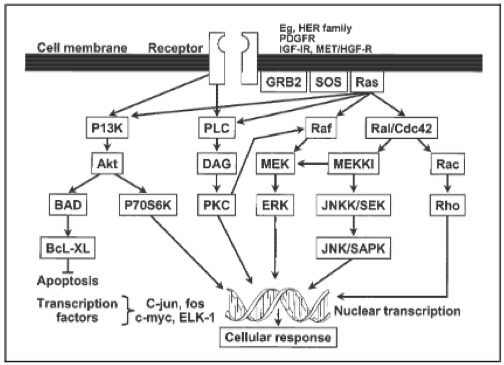 HRAS protooncogene polymorphism and breast cancer. Cancer Epidemiology Biomarkers & Prevention. 1993;2(2):131-8. 10. Kompier LC, Lurkin I, van der Aa MN, van Rhijn BW, van der Kwast TH, Zwarthoff EC. FGFR3, HRAS, KRAS, NRAS and PIK3CA mutations in bladder cancer and their potential as biomarkers for surveillance and therapy. PloS one. 2010;5(11):e13821. 11. Emuss V, Garnett M, Mason C, Marais R. Mutations of C-RAF are rare in human cancer because C-RAF has a low basal kinase activity compared with B-RAF. Cancer research. 2005;65(21):9719-26. 12. Davies H, Bignell GR, Cox C, Stephens P, Edkins S, Clegg S, et al. Mutations of the BRAF gene in human cancer. Nature. 2002;417(6892):949-54. 13. Kambara T, Simms L, Whitehall V, Spring K, Wynter C, Walsh M, et al. BRAF mutation is associated with DNA methylation in serrated polyps and cancers of the colorectum. Gut. 2004;53(8):1137-44. 14. Downward J. Targeting RAS signalling pathways in cancer therapy. Nature Reviews Cancer. 2003;3(1):11-22. 15. Zhou W, Ercan D, Chen L, Yun C-H, Li D, Capelletti M, et al. Novel mutant-selective EGFR kinase inhibitors against EGFR T790M. Nature. 2009;462(7276):1070-4. 16. Khatib A-M, Fallavollita L, Wancewicz EV, Monia BP, Brodt P. Inhibition of hepatic endothelial E-selectin expression by C-raf antisense oligonucleotides blocks colorectal carcinoma liver metastasis. Cancer Research. 2002;62(19):5393-8. 17. Cunningham CC, Holmlund JT, Schiller JH, Geary RS, Kwoh TJ, Dorr A, et al. A phase I trial of c-Raf kinase antisense oligonucleotide ISIS 5132 administered as a continuous intravenous infusion in patients with advanced cancer. Clinical Cancer Research. 2000;6(5):1626-31. 18. Arora A, Scholar EM. Role of tyrosine kinase inhibitors in cancer therapy. Journal of Pharmacology and Experimental Therapeutics. 2005;315(3):971-9. 19. Ratain M, Flaherty K, Stadler W, O'Dwyer P, Kaye S, Xiong H, et al., editors. Preliminary antitumor activity of BAY 43-9006 in metastatic renal cell carcinoma and other advanced refractory solid tumors in a phase II randomized discontinuation trial (RDT). ASCO Annual Meeting Proceedings; 2004.